Cervical radiculopathy is one of the rarer forms of neck and arm pain where your nerves that exit through the side of the neck become compressed or pinched. Often extremely painful and debilitating it can seem like it’s never going to end, however with appropriate physiotherapy treatment many people get relief. Get help now for your neck pain by calling 02 9144 1510 or by booking online here. The nerves to your neck and arm pass through small holes between the bones of the neck known as intervertebral foramina. Unfortunately there’s not a lot of space in these holes and things like material from a ruptured disc, degenerative changes in neck joints, arthritis or even tumours can compress the delicate nerves as they pass through. When a nerve root is irritated through compression and/or inflammation, the symptoms radiate along the nerves pathway into the arm & hand. Specific symptoms will depend on the nerve root irritated. The nerve roots most commonly involved are the C5 or C6 nerve roots, and degeneration and/or disc bulges are the most common cause. These nerve roots supply the outer side of the arm and pain and you’ll normally feel pins and needles in that area. In addition to these symptoms, some people will also experience headaches due to the close relationship between the neck and the head. 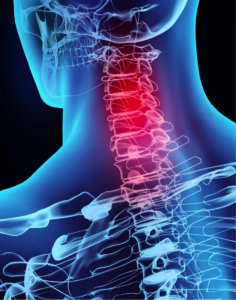 Neck Pain – How Can Physiotherapy Help Me? Physiotherapists are university trained in the assessment and treatment of spinal problems. Physiotherapists treat cervical radiculopathy using a variety of techniques, including joint mobilisation (a gentle, safe form of manipulation), traction, deep tissue releases and exercises. These treatments are aimed at reducing the inflammation of your nerve root(s) and on improving the function of the surrounding neck muscles and joints. Poor posture can also be a contributor to neck pain generally and to cervical radiculopathy, so our team at Turramurra Physiotherapy will also give you advice on ways to improve your posture both at work and when at home. This helps to relieve your pain by helping to remove the issues that triggered the original problem. Some people do need surgery for cervical radiculopathy, particularly if the pressure on the nerve is so bad that it is causing severe numbness or weakness or if those symptoms are getting worse. Thankfully though, most cases don’t need surgery and conservative physiotherapy treatment is the best approach. We can advise you on the best approach for your situation. Depending on the type of neck injury different recovery times can be expected. As a general guide: anywhere from 4 – 6 weeks can be expected. Some patients improve much faster, and some patients with chronic conditions may require more physiotherapy. What is certain though is that you should seek an assessment for neck pain. Left untreated, neck pain can become chronic and start to badly affect your quality of life. Be sure to book an appointment now by calling 02 9144 1510 or by booking online here.